It's flamingo time! Today we're making 3 Quick and Cute Flamingo DIY Ideas with a free printable flamingo design and cut file. Make all kinds of fun projects with my new flamingo art design. Print it and cut it out yourself or upload the png file to your cutting machine and cut flamingos all day long. Each of these quick crafts takes under 15 minutes to make… unless, of course, you want to get extra crafty and creative. I've created a printable flamingo design you can use in your fabulous flamingo projects. I'm also sharing 3 quick flamingo tutorials for you to try to help you get started with this fun craftiness. Today we're making a flamingo t-shirt, a flamingo water bottle and a flamingo phone case. The phone case and the water bottle are each 5 minute projects. The t-shirt could take you 15 minutes or if you get extra creative, you could turn it into an hour long art project… it's up to you! You can decorate just about anything with this cute flamingo. Make your own flamingo accessories in minutes! I picked up this confetti phone case in the Dollar Spot section of Target. You can use just about any kind of phone case with the glitter vinyl, but a hard plastic might work best. For both the water bottle and phone case, just cut the flamingo design out using a glitter vinyl. Remove the backing and place on the surface you want the flamingo to live. If you don't have a cutting machine, just cut out the flamingo from the printable and use it as a template to trace the shape on vinyl and then cut out the vinyl by hand. You can use scissors or a craft knife to get the details cut. You can add flamingos to all your things! Thing back-to-school cuteness… lunch boxes, book bags, binders, lock decor. Flamingo all the things! I used my Cricut to cut out the flamingo art as make an outline version of the flamingo. If using a Cricut – upload the art and prepare it using your Cricut Design Space software. Print the art on to printable t-shirt transfer. Follow the instructions on the t-shirt transfer packaging to apply the flamingo art to your shirt. Notes: I used the printed art on a t-shirt transfer, but I didn't like how dark the transfer was on my grey t-shirt (get the “for dark fabrics” t-shirt transfer if you are using anything other than white). So, I painted sparkly fabric paint over my printed flamingo. 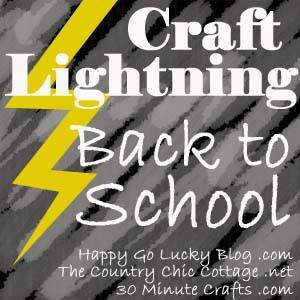 This tutorial is part of the Back-to-School Craft Lightning series. Click below to check out more fantastic back-to-school ideas! I hope you have fun making your fabulous flamingo swag! I'd love to hear about it! Love the Flamingo file. Awesome. Can’t wait for my Cricut Air 2 to get here. Thank YOU! I can’t wait to see what you make. Thank you so much for the note, I’m glad you like this project! I love all of these! Thanks for joining! Such a fun series, thank you for hosting… just for the record, I’m not ready for back-to-school yet!